Fishing can be a life-saving skill to raise. Why? Fishing allows you to fish all sorts of fish ranging from measly Shrimp to powerful Shark! You're able to cook the fish you earn with the Cooking skill and use the cooked fish to recover your Life Points. You'll need this food to help heal Life Points while fighting, training Agility and to help you while Thieving when you are caught red-handed. Fishing is also a good source of money. Want XP ASAP? This section is for you! The fastest way to train fishing is not by banking the fish but instead dropping them. This can be done extremely quickly by dragging a fish item onto the action bar (you cannot be on legacy mode). If you will be catching more than one type of fish (such as salmon and trout), you will have to drag each specific type of fish onto the action bar. When your inventory gets full, spam the button that relates to the fish you want to drop (similar to performing an ability). Power fishing may not always be necessary to get fast XP rates. In certain areas, banks may be nearby, allowing you to bank without wasting much time. Also, you can circumvent bank running by using signs of the porter, which you can learn about in the Divination skill guide. So you've decided to take up Fishing, eh? Well there are two towns where you can begin Fishing in: Taverly and Draynor Village. The best would be Draynor Village due to the relative closeness of its bank. You will also be able to stay in Draynor until at least level 20. The Map above shows where you can fish in Taverly and with which item. Crayfish are faster than Shrimps, however, cooked Crayfish will only heal 10 Life Points compared to the Shrimps healing amount of 30. If you want to bank your Fish, there is a bank on near the Taverly Pub. If you feel like Cooking, you may also chop a nearby tree and light a fire, which you can use to cook the crayfish. If you just want to get your Fishing level up quickly and don't really care about cooking at this stage, you should drop the crayfish or bank and sell them. Now, on to Draynor. Draynor is the best area for Fishing at this level. Getting to Draynor is easy, just walk West from Lumbridge (which can be accessed automatically using one of the lodestone teleports). 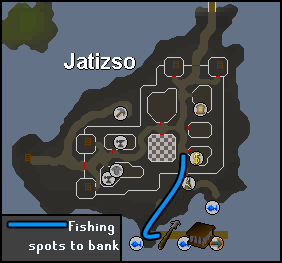 As you can see, the Bank is extremely close to the Fishing spot. If you are level 14 or lower, be aware of the Level 7 Dark Wizards that wander around the Fishing Spots. They aren't usually a problem as you are protected by the Willow trees, however they can get around and still be a problem. Don't forget there are other people Woodcutting and Fishing here with you, so every so often another player may kill a Dark Wizard for fun. Once you get level 5 Fishing, get a Fishing Rod and some Bait (from the Port Sarim Fishing store, from the Zombies in the Draynor Sewers, or from another player or the Grand Exchange). You'll be able to fish sardines. You should just bank these as they're better for cooking than for money. To fish sardines, Select "Bait" instead of "Net. You'll also get Herring at level 10 Fishing when using bait. Herring and sardines can be fished at Draynor. If you are running out of bait, you can switch back to net fishing at level 15 when you can fish for anchovies. Anchovies can also be fished at Draynor, but do not give much experience when cooked. Once you get 20 Fishing, you are able to fish Trout. Trout are popular due to their fast experience in Free-to-Play and in members (up to a certain point). First off, you are going to need some feathers. These should be bought from the Port Sarim, (killing) chickens, from another Player or from the Grand Exchange. Once you get your materials, head over to Edgeville. 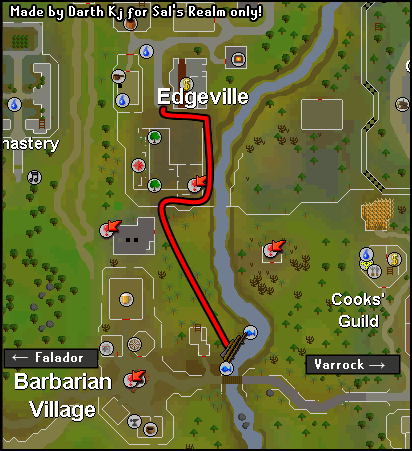 Edgeville is generally the most popular spot to be fishing on a freeplay world, given its close proximity to a bank. If you are powerfishing, then you could also try the spot in Lumbridge along the River Lum, however that area will have less people to socialize with. Members can also fish at one of the more popular fly fishing spots: Shilo Village. 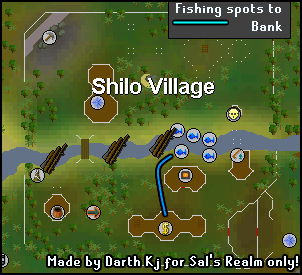 The Fishing spots are right next to a bank meaning quick and easy banking, as well as quick experience. If you stay here to 99, you can make quite a bit of money. If you are using a Summoning familiar to help you fish, there is a Summoning obelisk to the west of the River. 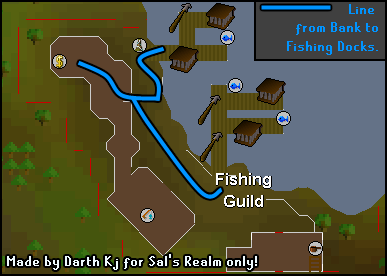 There is one last place where you can Fly-Fish and it is west of the Fishing Guild (in a members-only area). This method is nick-named "Rasolo Fishing" and it requires you to Fish a full inventory, then walk north to a wandering merchant called Rasolo, and sell him the fish. You make poor money, but it is around the same amount of experience of Shilo, but slightly faster. Therefore you're better off fishing at Shilo, but you can fish here if you wish to be alone. However one or two other players may occasionally be here. You will begin to catch Salmon at level 30. At this point, it looks like you're serious about fishing. Now would be a good time to check out our helpful items section. At level 70 fishing, you will be able to catch leaping sturgeons at Barbarian Fishing and should move to the Barbarian training area near Baxtorian Falls. This requires bait and a heavy rod, which can be found under Otto Godblessed's bed. You can also add it to your toolbelt. There are several pre-requisites to using this method. First, you must partially complete the Barbarian Training before using this method. Next, there are agility and strength requirements for this, shown below. The level 56 agility requirement for leaping sturgeon can be tedious to get for many. Also, the strength requirement forbids skill pures from taking advantage of this spot. However, if you have the requirements this is definitely the spot to be. It is fast yet relaxed, allows you to take advantage of the fish flingers minigame, and can get you some agility and strength experience on the side. Many, if not most, players choose to stay here until level 99. Overall, you will get 40-90k experience per hour here, depending on your level. C2 fishing is short for complexity two fishing. This method of training takes place while training the dungeoneering skill. The general idea here is to fish from the fishing resource areas in Daemonheim. Select a complexity two frozen floor, buy feathers, and rush through the dungeon, looking for resource spots. Use general tactics to rush through the dungeons. There are upsides and downsides with this method. The upsides are that you can also collect from the woodcutting nodes to gain woodcutting experience as well, with little harm done to your hourly fishing experience. You will of course gain dungeoneering experience as well, for completing the dungeons. The downsides are that experience gains are sporadic (resources spawn randomly), this method requires full attention, and that you need to be efficient good at dungeoneering to do this well. Hourly experience rates are around 80k/hr for fishing and slightly higher for woodcutting, so between woodcutting and fishing you could be getting 170-180k experience per hour. In both real life and RuneScape, fishing is a very relaxing activity. Here are some ideas for those who are interested in just shooting the breeze. So you've decided to take up Fishing, eh? Well there are 3 towns where you can begin Fishing in: Lumbridge, Draynor Village and Al Kharid. 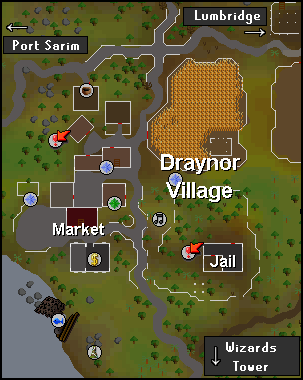 The best would be Draynor Village due to the relative closeness of its bank. You will also be able to stay in Draynor until at least level 20. The Map above shows where you can fish in Taverly and with which item. Crayfish are faster than Shrimps, however, Crayfish will only heal 10 Life Points compared to the Shrimps healing amount of 30. If you want to bank your Fish, there is a bank on the near the Taverly Pub. If you feel like Cooking, you can chop down a nearby tree and cook the crayfish. Off to Draynor now. Draynor is the best place for Fishing at this level. Getting to Draynor is easy, just walk West from Lumbridge. While Draynor does not have Crayfish spots, there are still the good shrimp spots, which give the same experience as crayfish. Once you have a full inventory, you should bank your Shrimp and cook them later. Once you get level 5 Fishing, get a Fishing Rod and some Bait (from the Port Sarim Fishing store, from the Zombies in the Draynor Sewers, or from another player or the Grand Exchange). You'll be able to fish sardines. You should just bank these as they're better for cooking than for money. To fish sardines, Select "Bait" instead of "Net. You'll also get Herring at level 10 Fishing when using bait. Herring and sardines can be fished at any of the above locations. Once again, Draynor is the best place to fish at this level due to the closeness of the bank. Alright, so you've fished Shrimp for a bit and you're level 16. Now what? Well, head over to the Fishing Store and buy yourself a Big Fishing Net (Make sure in the title it says "Big"!). Still Fishing in Catherby, Begin to fish with your big net. You'll obtain trash like boots, gloves and seaweed; however you may occasionally come across an Oyster or a Casket with Treasure inside! Seaweed can be used in Crafting (along with Molten Glass) to make items such as Vials. So if you are an avid Crafter, keep them. You will begin to catch Salmon. If you want to, you can fish Tuna with a Harpoon (Purchase from the Grand Exchange, Port Sarim Fishing Store or another player) and head over to Port Sarim (Read below to find out how to fish Tuna).This is slightly more valuable than Trout. Fly-fishing Trout and Salmon is the fastest way to get 99 Fishing in Free-to-Play. You're beginning to get pretty good at Fishing now. You now have the access to one of the best Money-making methods in Free-to-Play. 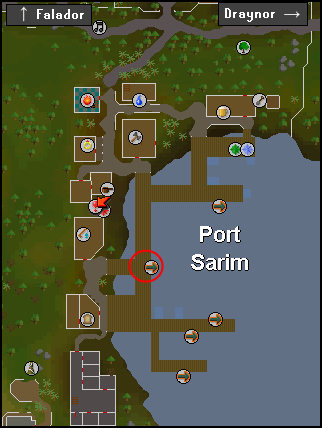 Grab a Lobster Cage from the Port Sarim Fishing Store, Grand Exchange or another player and 60gp then head to Port-Sarim. You only need 30gp if you have access to an Explorer's ring 3 or choose to teleport to Falador and bank there (More details below). 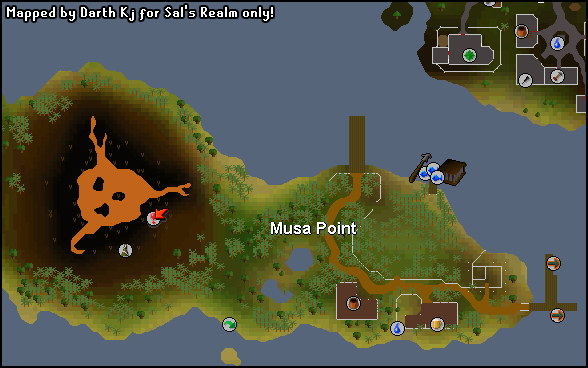 Head over to the Red Circle and pay 30Gp to one of the three Customs Officers and you'll be on a boat to Musa Point. Once you're there, head over to the Fishing spot (Indicated by the Lobster Cage and harpoon). Once there, you can fish Lobsters and Tuna (with a Harpoon). Lobsters sell for around 300-400gp each. You'd be better off to note your fish, which can be done by speaking to Stiles, who is located south of the Karamja Volcano. Stiles will note your lobsters, tuna, and swordfish all for free, saving you lots of time that you would spend banking. Just don't die and lose all of your noted fish! 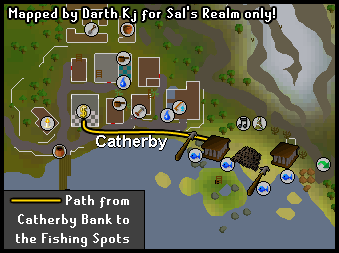 You can also fish in Catherby if you are a member. As you can see, it is close to a bank. There is conveniently a summoning obelisk nearby if you need to recharge your fishing familiar. At level 50, you'll be able to fish Swordfish with a harpoon. Congratulations! You can fish every-single fish in the Free-to-Play game! You are now able to fish Swordfish which can sell from 500-600gp. However they are caught along with Tuna, so you'll get more Tuna than Swordfish. These can be fished right next to the Lobster Fishing spots by selecting "Harpoon" instead of "Cage". If you are serious about 99, you should consider getting Members. However if you are unable to get Membership, you still can get 99 Fishing in Free-to-Play, however it will be slower. The best way to get 99 is to fish Trout and Salmon (as said above). It is your choice if you want to drop them or bank them, but banking them will make you quite a bit of money in the long run. At level 55 (Along with 35 Strength), If you have been taught in the ways of the barbarian, you will be able to fish Tuna with your bare hands. At level 58 (and 30 Agility and Strength), you'll be able to catch Leaping Salmon with Barbarian Fishing at Baxtorian Falls. If you can, it is highly recommended to complete the Swan Song quest at the Piscatoris Fishing Colony. Doing so will allow you to fish Monkfish. Fast experience and good cash. They usually sell for around 300-450gp. 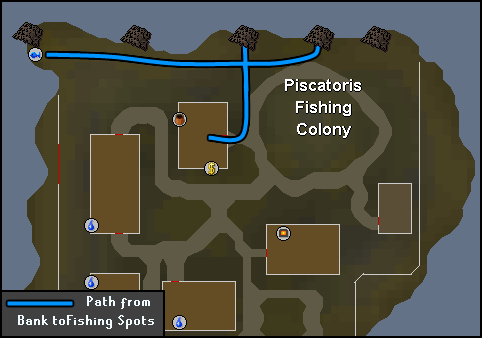 To fish Monkfish, you'll need a Small Fishing Net, purchasable from the Piscatoris General Store for 50gp. At level 70 (and 45 Agility and Strength), you'll be able to catch Leaping Sturgeon through Barbarian Training at the Baxtorian Falls. At level 70 (Along with 50 Strength), If you have been taught in the ways of the barbarian, you will be able to fish Swordfish with your bare hands. If you are able to fish Monkfish (see above), you should consider fishing them to 99 if you want to get 99. They're good experience and good money. To reach 99 from 62 by fishing Monkfish will require you to fish a whopping 105,839 monkfish, but in the end you'll be quite rich and/or have plenty of monkfish to cook. Once you reach level 68 Fishing, you now have access to the world-famous Fishing Guild! If you are fishing Lobsters or Swordfish, it is highly recommended to fish here because the bank is extremely close to the Fishing spots. The Fishing Guild is located North of Ardougne, West of Seer's Village and the Ranging Guild. You can enter the Fishing Guild at level 63 with an admiral pie, or 65 with a fishing potion. Congratulations! You can now fish Sharks! Sharks usually sell for around 1k and can be an excellent money-making method. You can fish Sharks at Catherby, Jatizso, Burgh de Rott, Just north of Mobilising Armies or the Fishing Guild. 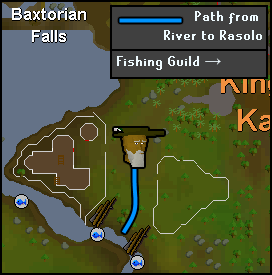 Out of all of them, The Fishing Guild is the best place as it is closer to the bank than the other locations. Sharks can be caught on a Net/Harpoon Fishing spot, and they are not caught with Swordfish or Tuna. Shark Fishing spots can be found throughout Catherby Beach. Jatizso is a good place if you wish to be alone. However, There may occasionally be one or two other players here. 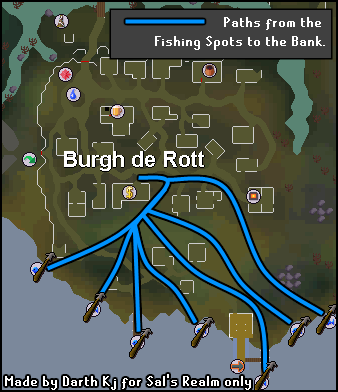 Another location where you can fish Sharks is in Burgh de Rott. It is not as close to the bank as some of the other locations however, it is isolated. There, of course, may be the odd one or two other players there. Once you reach level 85, you will be able to fish the Cavefish. These can be found at the Living Rock Cavern and give a whopping 300exp a catch, but can be slow. They are also near aggressive Living Rocks (which vary from level 120 - 200) so you will be occasionally attacked. They also vary around 1,500-2,000 Gold each. You will need to bring as much bait as you need with you when you come to this cavern as the only bank nearby is a deposit box. At level 90, you can fish the highest level fish available. The Rocktail. 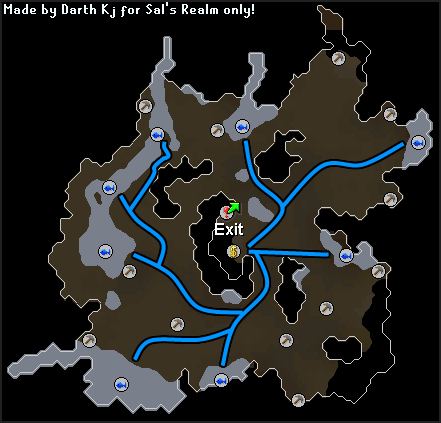 Rocktails are also located in the Living Rock Caverns, which are located in the northern Falador mines. This is a very relaxed method of training, allowing you to check your screen only once every few minutes. The experience here ranges from 40-60k an hour, depending on how many of the experience boosting items you use. If you wish to bank, there is a deposit area near the entrance. You could also use signs of the porter for even more AFK training. The official LRC world is world 84, which you should use if you wish to avoid attack from the creatures. It is not recommended to fish Sharks, Cavefish or Rocktails to 99 as it will take an extremely long time, but you'll usually make a whopping 100+ million Gp depending on the cost of the fish. This may sound good, but it will take an extremely long time. After 10-20 minutes or so in this cavern, the Living Rocks will become "tolerant" of you. In other words, they will not attack you until you leave that section. However, there is another downside. As the Fishing spots move around, you will have to leave that "section" and if you return then they'll probably be aggressive again. At Fishing level 96, you'll be able to catch Sharks with your hands, first you need to be taught in the ways of the Barbarian and have 76 Strength. If that isn't enough, Consider this: With Barbarian Fishing, you'll need to drop your offcuts every inventory. With Shilo Village and Monkfish you can easily bank your fish, but Monkfish will give more money for slightly lower experience. If you want to make lots of money and don't mind getting slightly lower experience, Monkfish would definitely be the best. If you want moderately fast experience and a good amount of money by 99, choose Shilo. If you just want to get 99 and don't really care about cash, choose Barbarian Fishing. Congratulations on becoming one of the best Fishers in the whole of Runescape! You are now entitled to a Cape of Achievement for the low-low price of 99,000gp! 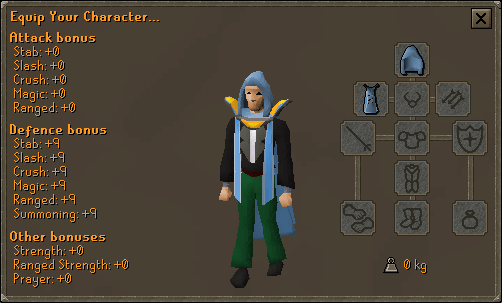 To purchase this cape, head over to the Fishing Guild, North of Ardougne, West of Seer's Village and the Ranging Guild. Whenever you wear this cape, everyone around you will know that you are one of the best Fishers in the game. Not only that, but every time you put on the cape (or "Operate" it via the Equipment screen when you have equipped it), you'll have 100/99 Fishing for a minute or so. This may help you catch a Shark or two quicker. But that's not all, you'll also have access to a spectacular emote! (To use the Fishing emote, you'll need to have your Fishing cape equipped). To access the emote, go to the Emote panel and select the icon that looks like a Ranger holding a longbow to the left. If your skillcape is trimmed (It will become trimmed once you receive 99 in two or more skills), then you'll also have a +4 Prayer bonus. This does not apply to untrimmed capes. You can find out how many fish you need to advance to the next level (or what level you choose) by going to Sal's Fishing Calculator. There are also quests which let you choose the reward. Legends Quest - 7,650 exp to four skills of your choice. While Guthix Sleeps - 100,000 experience in four skills of your choice over level 65. All 400,000 experience can be used on the same skill and you can wait until later to obtain the experience if you wish to get a certain stat to level 65 that is too low. An important Distraction and Diversion you should take advantage of while training fishing is Fish Flingers. Entering the game requires a fish flingers ticket, which can be obtained while fishing outside of Daemonheim. There is a fish flingers representative who you can speak to to enter the game. The representative will also hold your tickets for you. The objective of Fish Flingers is to catch the most amount of weight in fish you can in ten minutes. There are several types of baits, casting, weights, and hooks you can use to try and make the most out of the game. In this way, it is somewhat similar to real life fishing. You should try to play around with the different types of tackles until you get a high percentage catch (with 100% being preferred). For doing this activity, you will get fishing experience (likely more than you would have gotten staying at your fishing spot) and also fish flingers tokens, which can be exchanged for the fish flingers outfit (see below). This outfit boosts experience gained during fishing. The Fisherman's Outfit is a set that gives extra experience when fishing. Each piece gives +1% fishing experience when worn. There are four pieces and the complete set gives an extra 1%, so a full set would give a 5% boost. Each piece is worth 140 Fish Flingers Tokens. Divine bubbles are player spawned areas where you can fish a particular catch for a certain amount of time. These bubbles last 30 seconds and allow you to fish very quickly, allowing you to gain large amounts of experience as well as fish. If people fish from your divine bubble as well, you can gain noted fish in return. There is however a cap on how many fish you can obtain every 24 hours. You can either make your own bubble (see the Divination Guide) or fish someone else's. If you wish to fish from someone else's bubble, you should head over to Burthorpe or another densely populated area and look out for them. Fishing urns are items that will slightly enhance fishing experience gained. These urns will collect guppies over time during fishing. When an urn is full of guppies, you can teleport it away for a fishing experience. This will not affect your fish catches in any way. There are crafting requirements on urns, however. There are five types of fishing urns, the first three of which are freeplay. The cracked fishing urn requires level two crafting to make and can be used when fishing for fish below or at level 15. You will get 150 experience for every full urn. The fragile fishing urn requires 15 crafting to make and can be used when fishing for fish below or at level 30. You will get 350 experience for every full urn. The (normal) fishing urn requires 41 crafting to make and can be used when fishing for fish below or at level 50. You will get 500 experience for every full urn. The strong fishing urn can be crafted at level 53 crafting and can be used when fishing for fish below or at level 70. You will get 600 experience for every full urn. Finally, the decorated fishing urn can be crafted at level 76 crafting and can be used when fishing for any type of fish. The decorated urn gives 1900 experience per full urn. Fishing urns can be bought off the Grand Exchange uncharged, but you must have the specified crafting level to charge them. They are charged using one water rune per urn. There are two special harpoon's that are called the Volatile Clay Harpoon and the Sacred Clay Harpoon. They can be obtained via the Stealing Creation Activity. The Volatile harpoon gives an extra 120% more experience per fish and the Sacred Clay harpoon gives double the experience you receive from the fish. Skillchompas are chinchompas that give bonus experience to your catch when equipped. There are four types: Cobalt (requiring 31 fishing), Viridian (requiring 41 fishing), Azure (requiring 51 fishing), and Crimson (requiring 61 fishing). Every skillchompa will give 10% bonus experience but the higher level skillchompa will provide a higher chance of catching fish. These skillchompas can be caught through the Hunter skill or bought on the Grand Exchange. There are special gloves known as "Shark Gloves" or "Swordfish Gloves" that you can use from the Fist of Guthix Activity. They give 100 experience extra when fishing Swordfish or Shark depending on the type of glove however, they glove crumbles to dust after 1000 catches. Swordfish gloves require 65 Fishing to use them and Shark gloves require 90 Fishing to use them. To get to your Fishing spots quicker, consider purchasing a locator from Mobilising Armies. These can teleport you to all sorts of resources for various skills. The higher rank you are in Mobilising Armies, the better your locator will be. Try not to be wasteful as they only have 50 charges! You can use certain Summoning familiars such as the Ibis (56 Summoning) or the Granite Lobster (74 Summoning) to invisibly boost your Fishing level by a certain amount of levels, some can even collect fish for you. Read the Summoning Guide for more details. The "invisible" boost will not allow you to catch fish that you would not be able to fish without the boost. So if you have 74 Fishing and have an invisible boost of +2, you will not be able to fish sharks.